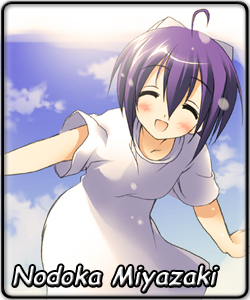 Nodoka is nicknamed Honya-chan (Bookstore). She is one of the 4 members of the Library Exploration Club (Konoka is the 4th member). Why it is called "Exploration Club" and not "Librarian's Club" is because this is Mahora Academy's Library, which has its own island and is more like a dungeon than a library. As such, members of the club get used to spotting and avoiding traps, scaling cliffs (er, bookshelves), etc etc. Despite such an exotic club activity, she is shy and her hairstyle at first covers up her face. Very early in the story, Negi saved her from a fall down the stairs - back then she didn't know of magic so thought Negi-sensei had heroically caught her (suspending her belief since a 10 year old boy shouldn't be able to catch a 15 year old girl from a fall from 2~3 metres high). Thus a crush was born and with the help of her friends (fellow club members Yue and Haruna) she slowly makes progress (starting with not hiding behind her hair so much).